LetsGoDU can confirm that the New York Islanders will sign Matt Donovan to a professional contract today. Look for an announcement from the Islanders sometime this afternoon. Donovan, a Sophomore from Edmond, Oklahoma established himself as one of the premier defensemen in college hockey. 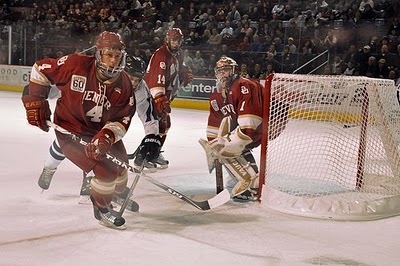 Over the course of two season at DU he recorded 16 goals and 37 assists in 78 career games. This season Donovan was +17 with 9 goals and 23 assists. He scored the game tying goal with less than two minutes remaining against Western Michigan in the NCAA Regionals. Donovan's career highlights include winning a gold medal as a member of the 2009-10 USA World Junior Championship team, 2010-11 All-WCHA 2nd Team, WCHA All-Rookie Team member in 2009-10 and a USHL All-Star with Cedar Rapids in 2008-09. I have watced Dono for two years. His play inside his own blue line is weak. It needs serious work. Yes, he is very good on the power play and bringing the puck up ice but defense is defense. Those big strong N.H.L. forechecking forewards will chew him up. He's a good kid and I wish him the best but wonder. Hopefully he's the only one. This is getting old, two and out. I guess the only loyalty of some of the players is to the almighty buck. I will take the Ostrows of the world any day. They may not have the raw talent, but they give 100% and they know the meaning of loyalty. I agree Aluum. No doubt about his talent, but he never threw himself around like Ryder. Donovan is a great player. He'll be missed. Wish him nothing but the best of luck and can't wait to see him suit up for the Islanders. Not a shocker, but disappointing nonetheless. It's always tough to lose a player of Donovan's caliber after only two seasons. I hope he has a long and productive career in the pros. I guess my feelings are the same now as they were when Wiercioch left--disappointed to lose both guys but confident that the talent is there to replace them effectively. With Makowski back and Mayfield and LaLeggia coming in, DU should be in good shape. As I said before, I thought Donovan was up and down this year. But no question he has a boatload of potential. I'm sorry to see Matt go. But Makowski is coming back, and there are one or two good puck-moving defensemen coming in. So the positive news that Ryder is coming back outweighs the negative news that Donovan is leaving. I think Donovan is a ways away from getting to the NHL, with his occassional defensive lapses. But it's his dream, and you can't blame him for following it. Good luck to Matt. Enjoy toiling around for years in the AHL/ECHL Matt. Have to wish Matt the best of luck. Would have loved to see him play another year at DU. We'll see. The Islanders have a vested interest in getting him to the Show. Fourth round picks who make it to the NHL make GMs, scouts and the organization look real smart. Plus the fact that the Islanders are chock full of young players and building for the future. I can't imagine a better situation for Matt. Shore, Zucker and Gwoz will be next. Can't blame him for taking the money - he's worked most of his life to be a pro hockey player, and now he'll be one. We should all be so lucky, ready or not. I'm a lot more concerned about losing Zucker than Dono. Anon 11:34: have you had your head in the sand, and missed Ryder's endless stream of big (and legal) hits this season? He was an invaluable physical presence on a team that otherwise didn't put fear into the hearts of opponents. Skating talent isn't the only thing that counts. Plus, Ryder's skills improved as the season went along. He became a go-to defenseman for DU, getting major minutes down the stretch. I believe Donovan added more with his offence than Ryder with big hits. Don't get me wrong, I love Ryder’s big hits but when he took out the man the puck often went to a player from the other team rather than DU. Much like Donovan’s offensive play, Ryder’s hits left Lee, Phillips and Nutini to pick up the slack defensively. Ryder didn't leave the others to pick up the slack. Getting the man instead of the puck is a smart hockey strategy! It is a TEAM sport. Also, take a look at how many goals against Ryder was on for versus the goals Dono was on for...Ryder was on for Far less...He is a defensive D. Teammate have said in interviews that Ryder's hits can get the team pumped up.